I’m no world traveler, but if I were, I’d have tried one of the many versions of this salsa served all over South America. Truly wonderful with a bit of a sweet/sour undertone, I literally crave it at times. I’ve served it to others, too, who can’t get enough of it. Make it as fiery hot or mild as you’d like, and chop it, blend it or mash it with mortar and pestle. Here in Minnesota, true authenticity is out; I’ve never seen the small red/yellow peppers known as the Aji. That doesn’t mean I have to miss out on the deliciousness – we do have the fruity Habanero and with a little tinkering I’ve come up with a perfect version with just a touch of heat. I often serve this Aji Salsa, generously, with chunky vegetables as a refreshing side dish. When I serve it as a condiment or a dip, I serve as shown in the photo, and I may, if the mood strikes, pulse it lightly in my food processor. Like many Salsas, the taste only improves as it sits. 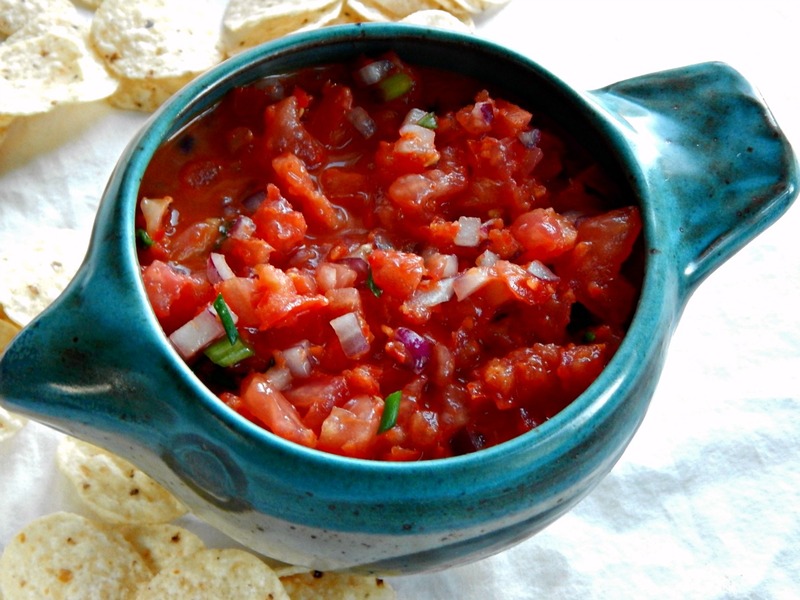 Using reasonably priced ingredients, the Salsa runs about $2.14 to make. Place the peppers in a food processor or blender with the vinegar, lime juice, salt and sugar and olive oil. Process until nearly smooth. Add the chopped tomatoes, chopped onion, green onions and cilantro to a bowl, drizzle with the pepper blend. Taste for seasoning and add more salt/sugar/black pepper as needed. Store in refrigerator until ready to serve. Note: When made with a whole Habanero, this burned the tip of my tongue and left a little burn in the back of my throat. I tried it the next time with just a half and thought it was perfect – just a little spicy, giving the vinegar and tomatoes a chance to shine. Of course, if you love heat, use more! By all means, don’t be bound by tradition – feel free to put what you like in this salsa and make it your own. Recipe made July 2012, repriced in February 2014 with a 14 cent increase. This entry was posted in Click here for Fabulous Food Posts and tagged Appetizer, Bell Peppers, Condiments, Habanero, Latin American, Lime, Peppers, Red onion, Salad, Salsa, Spreads and Dips, Tomatoes, Vegetable Side, Vinegar. Bookmark the permalink.